All of our new parts are aftermarket replacements. Fits Minneapolis Moline Tractor(s) G940. Fits Oliver Tractor(s) 1855, 1950, 1955. Fits Waukesha Engine(s) D310T. 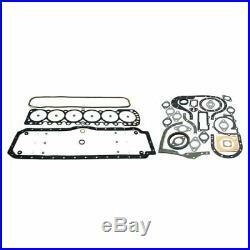 Contains all gaskets necessary for a complete engine overhaul. All States Ag Parts Item No. This item ships for Free! The item “Full Gasket Set Oliver 1950 1855 1955 Minneapolis Moline G940 Waukesha D310T” is in sale since Friday, August 3, 2018. This item is in the category “Business & Industrial\Heavy Equipment, Parts & Attachments\Heavy Equipment Parts & Accessories\Tractor Parts”. The seller is “tractorpartsasap” and is located in Lake Mills, Iowa. This item can be shipped to United States.